The riders are eased back into racing following Monday’s respite with a stage without as much as a speed bump decorating the parcours. 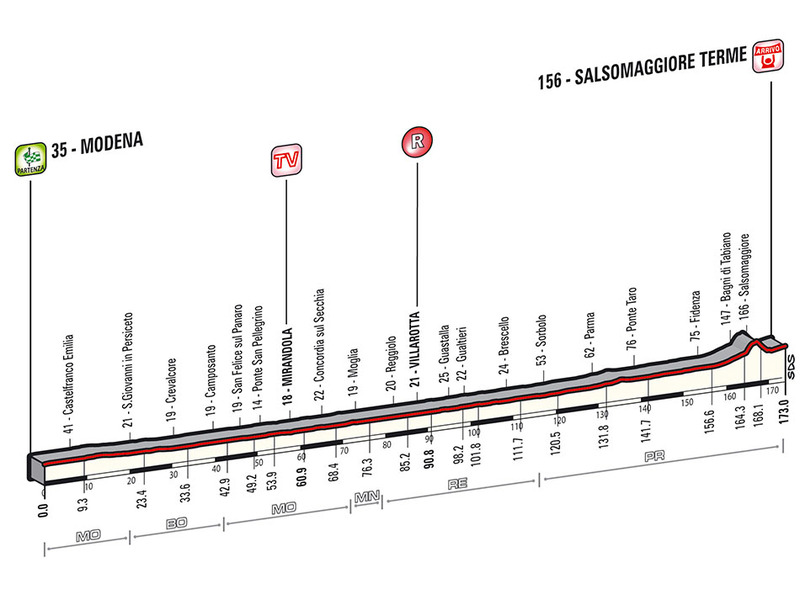 The rest day only involved a short transfer northwards from Sestola to Modena, and today’s racing takes the peloton north and then east until arriving in Salsomaggiore Terme for a finishing circuit. Before arriving, the peloton passes through Parma, which — as well as being the home of Movistar’s Adriano Malori and 1965 Giro winner Vittorio Adorni — hosted a stage finish in 2011. That too was a flat stage and was won by Alessandro Petacchi, much to the anger of a gesticulating Mark Cavendish, who felt the Italian had veered from his sprinting line. They’ve since kissed and made up and are now are team-mates at Omega Pharma. The finish line is slightly uphill, which could give a chance to a different kind of sprinter to challenge the usual suspects — Gianni Meersman, John Degenkolb or, dare we say it, Matt Goss for instance. The riders will get to sample this finish line on the first of two laps in Salsomaggiore, allowing the pure sprinters a chance to plan how to distribute their effort in the finishing sprint. The peloton may fly around the start town of Modena with some pretty impressive speeds, but not as fast as some of the sports cars that come from here: Ferrari, Lamborghini and Pagani. The equally loud but far slower Luciano Pavarotti was also born on the outskirts of Modena.